All GLAMIRA products are fully customisable to your preferences. We are committed to your satisfaction. If you are not happy with your choice, return it within 60 days. Call us at 2 5507 9007. Our customer support team will be happy to assist you. GLAMIRA guarantees safe delivery of each order. Cherished as the most elegant gift to a special one, pearls are one of a kind natural wonders. Extraordinary stone cut meets inconceivable beautiful designs! Let your dreams turn into reality with the desirable cabochon jewelry… Find the most sensational piece that will be the most loved in your jewel case! As the only and true preference of the kings and queens, platinum is four times stronger than gold and is the best choice to reveal the natural radiance of diamond. An excellent deal, on several occasions I communicated with customer service and I had quick response and a lot of respect. 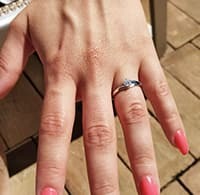 My girl loves the phenomenal ring, both design and style, nice finish and well done details. Again an excellent evaluation. 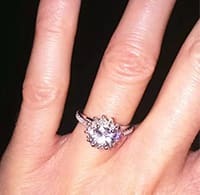 I'm extremly satisfied with my engagement ring. It's comfortable and easy to wear! I bought 0.25 carat diamond and the side stones were also diamonds. Good price despite it! It shines so well! I chose this ring as an alliance with white sapphire and diamond. One word when I received it, WAHOU!! It is splendid, even more beautiful than I had imagined. The delivery time was very correct. I am delighted, I recommend this website. I bought this ring on 02/06/2017 for a wedding proposal. The ring was marvellous. The quality and the design is excellent. Everything was perfect. 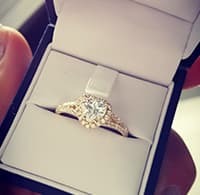 The ring is very beautiful and the quality is very fine. It leaves a very comfortable feeling on my finger. I am highly satisfied. If you can't find your dream jewellery in any store, you are at the right address! GLAMIRA can custom make any style that you are looking for. Diamond certificates are important as they show the quality and the value of the diamond on your jewellery. 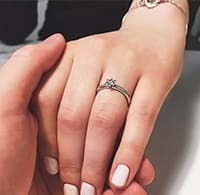 Tell GLAMIRA what you need and our jewellery specialists will go through thousands of unique designs for you to find the perfect jewellery for your special occasion. GLAMIRA.com.au: Jewellery enthusiasts will love it! GLAMIRA.com.au is the online shop for all jewellery lovers. With a wide range of high-quality jewellery, GLAMIRA.com.au offers an attractive and upmarket assortment of jewellery for every taste. In addition to trinkets, there are women’s, men’s and kids’ jewellery made of silver, gold, stainless steel and many other materials. With GLAMIRA.com.au’s jewellery, it is easy to perfect your own style and to feel absolutely great in the process. Extravagant earrings or diamond jewellery for your big evening entrance, trendy bracelets, charming necklaces, fascinating diamond cufflinks and fashionable rings leave nothing to be desired. You can also find personalised creations such as jewellery engraved with names in our ample assortment of beautiful personalised necklaces. Whether it is women’s jewellery, men’s or kids’ jewellery you are looking for, at GLAMIRA.com.au you will discover earrings, necklaces, bracelets, engraved jewellery, diamond cufflinks or the one ring that will enchant you. Lovers of elegant diamond jewellery and men’s jewellery will enjoy our copious categories of jewellery. The innumerable selection of ring models alone is enough to make you want more. 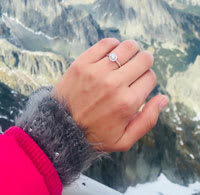 Whether you want enchanting diamond rings or trendy and inexpensive rings with zirconia stones, GLAMIRA.com.au offers your personal dream ring for every price, range and style. Also at GLAMIRA.com.au, you can give someone else unforgettable enjoyment. Personalised necklaces or lovely diamond rings from our collection of various pieces of diamond jewellery are presents that express your feelings in an unmistakable way, for diamonds symbolise love for centuries. Specially personalised pieces of jewellery are also a sign of great affection. They are companions for life and good luck charms at the same time. As an established online jeweller for jewellery, we also offer you marvellous diamond cufflinks in various designs and in all price ranges. At GLAMIRA.com.au, you can find a dazzling array of diamond cufflinks along with those with Swarovski gems. With our large collection of choices, everyone can find their appropriate dream jewellery. Trendy women’s jewellery, elegant men’s jewellery and casual kids’ jewellery, or glimmery and attractive cufflinks: GLAMIRA.com.au’s jewellery suits your style and is of a high quality so that they can be enjoyed for a long time. 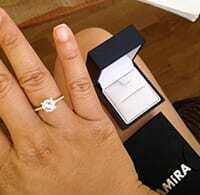 With jewellery from GLAMIRA.com.au, you can enjoy shining like a bright star as well as give enjoyment. Whether for you, dear friends or a loved one, GLAMIRA.com.au is the jeweller to trust!